A nice looking fingernail is an important cosmetic goal when dealing with traumatic lacerations and crush injuries to the fingertip. But there’s more to these injuries than just cosmetics. An intact fingernail allows us to more finely grasp small objects; it improves tactile sensation; it even helps regulate circulation to the distal fingertip. Think of your fingernail as the “armor” for your sensitive and vulnerable finger tip. 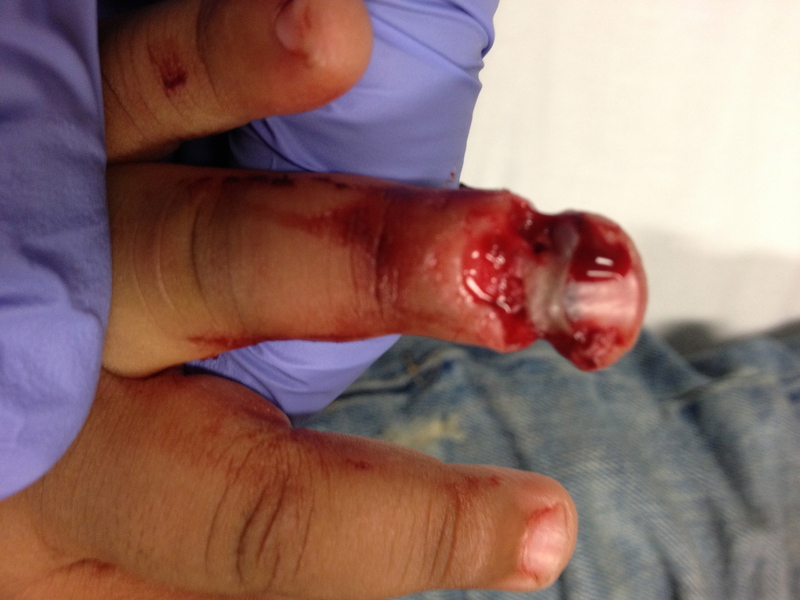 A 3-year-old child with a crush injury to the distal finger, with interruption of the nail bed matrix and laceration of the nail bed and surrounding tissues. A hand surgeon was consulted to aid in repair of this complex injury. 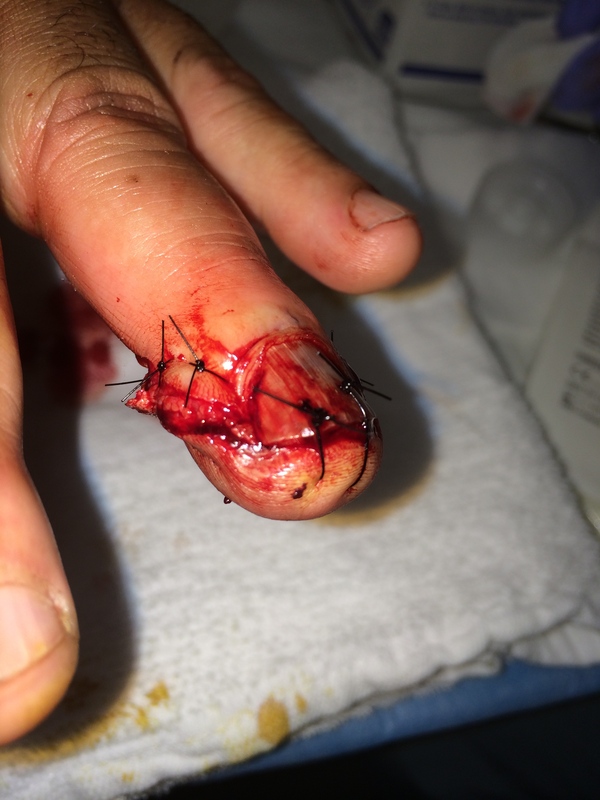 In Part I of this post, I gave an example of a nail bed laceration that was closed in my ED using fairly traditional methods and teaching. In this second segment, we’ll further delve in to some of the evidence and novel techniques regarding management of nail bed injuries. I’ve framed the discussion in terms of some of the common questions that arise in management of these injuries. Nail bed injuries occur commonly. Do we really need to remove that nail and repair the nail bed every time? Historically, it has been largely believed that failure to repair a laceration to the nail bed can lead to abnormal nail contouring and dystrophic growth of the fingernail. The argument made in favor of primary repair of a nailbed injury in the ED is that delayed repair is both more technically challenging and may have less favorable cosmetic outcomes. Thus, traditional thinking has been that it is a duty of the emergency physician to perform the repair. This said, there is data in support of a more conservative approach. An important study published in the Journal of Hand Surgery in 1999 did an excellent job of addressing the question: do all nail bed injuries do better with nail removal and primary repair? Fifty-two children with fingernail crush injuries were divided in to operative and non-operative groups. The operative group had nail removal, exploration, and repair of lacerations. The non-operative group was managed with nail trephination (to evacuate subungual hematoma) or by simple observation. The authors found no notable difference in cosmetic outcomes between the groups, regardless of hematoma size, presence of fracture, injury mechanism, or age. This is a nice leg to stand on if you feel that the nail bed injury you are treating will do just fine with conservative management–but sometimes, as in the case we described in Part I, the proximal nail will already be avulsed, so exposure of the underlying nail bed is somewhat of a done deal. And other times, injuries to the actual nail and the nail bed are extensive and occur together. This is commonly the case when power tools attack. In these situations, the question may not be whether to remove the nail, but rather, how the heck to put it back? 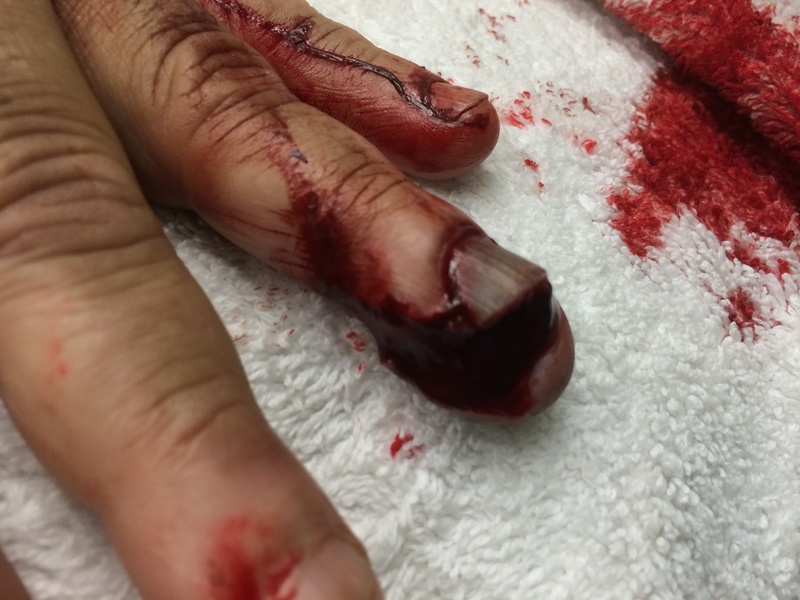 An extensive fingertip injury caused by a power tool. The nail, skin, and subcutaneous tissue are involved. Underlying distal phalanx tuft fracture is also present. I was taught that I need to keep the eponychial fold stented to increase chances of normal nail re-growth. If I do remove the nail, is it better to replace the native nail or use an artificial stent for the eponychial fold? Replacing an avulsed native nail plate (after a nailbed laceration repair) is the preferred method of protecting the nailbed and the eponychial fold. The original fingernail is considered to be the ideal biological dressing. This is an old belief, but recently reinforced in a retrospective review of 700 patients published in The World Journal of Surgery. These authors found that native nail splints had fewer nail deformities, and silicone nail splints were twice as likely to develop infection. This said, if it isn’t an option (e.g., the original nail is lost or too macerated to replace) traditional teaching is to place some type of inert material there to prevent scarring down of the eponychial fold, which can impair regrowth of new nail from the germinal matrix. In truth, no studies I found support this as a mandatory action, at least one older study suggests that nail replacement may not make a difference, and there may be some evidence that this practice can lead to increased morbidity. In a single center, retrospective study of pediatric referrals to a hand surgery clinic, it was found that stenting of any kind (native nail or foil) was associated with slower healing and higher risk of infection. It’s hard to determine how well this study generalizes to the adult population and if it would be reproducible in a prospective fashion in a pediatric population, but it is certainly food for thought. Can I expose the nail bed laceration without completely removing the nail? 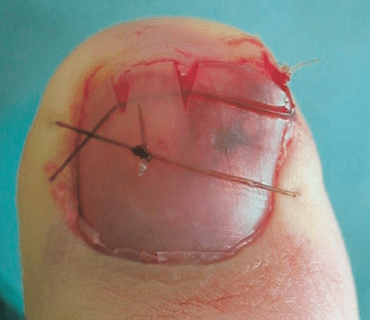 An interesting article published in the Archives of Dermatology discusses alternatives to complete nail avulsion for exploration of the nail bed without removing it. Though they describe surgical exposure in an elective setting to look for pathology under the nail, many of the ideas can be extrapolated to EM practice. These techniques may also be useful for removal of foreign bodies such as splinters trapped under the nail. Longitudinal partial plate avulsion, one of several interesting techniques discussed here: Collins SC, Cordova K, Jetlinek NJ. Alternatives to complete nail avulsion. J Am Acad Dermatol 2008 Oct; 59(4):619-26. Ok, so I removed the nail to repair the nail bed laceration. Now I am having difficulty suturing it back in place. Any tips? This can be tricky business, and is probably why many providers are reluctant to remove a nail in the first place. One problem often encountered is that the thick nail plate is tough to drive a needle through, and can sometimes bend the needle. Furthermore, when reattaching a nail with sutures, it is better to first sew through the soft tissue then exit through the nail. This is counterintuitive, as it is certainly easier to sew through the hard nail first, then exit through the soft tissues. Why? If you go through the nail first, the risk is formation of a foreign body granuloma within the tissue spaces. Thus, it is safer and preferred to start on the side of the soft tissue and exit the nail. But that’s hard to do. A few tricks: (1) pre-soak the avulsed nail portion in warm water to soften it. (2) Determine where you are going to suture through the nail, and pre-drill holes in it with an 18 gauge needle. This will allow you to more easily sew first though the tissue, then out the nail. With this small amount of preparation, the nail reattachment process can be much easier. What’s the ideal suturing technique? A suture thrown on either side of the onychial folds and through the lateral nail will at best act as loose anchors of nail attachment. As seen in the video in Part I, a repair with side anchor sutures led to early dehiscence of the stent. Another reattached nail is seen here, anchored by a single suture in the proximal nail bed. This nail was removed, the damaged distal portion was trimmed, and the native nail was reinserted and anchored with a single suture. What potential pitfalls may exist for this method of securing the nail? 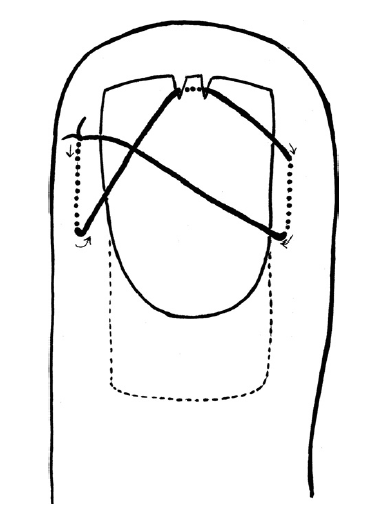 While this is an acceptable technique, potential problems include iatrogenic trauma to the germinal matrix from the suture and the possibility that nail might “wiggle” its way out. Ultimately, if the goal is to keep the nail firmly wedged within the eponychial fold, there is a significant chance that these types of anchoring methods will fail you. Here is a better way, described in the Journal of Hand Surgery by Bristol and Verchere, that takes just a few extra minutes of time: use of a transverse figure-of-eight suture through a pre-prepared, wedged nail. This method has the advantage of achieving pressure proximally and ventrally to secure the nail under the the eponychial fold. Cartoon depiction of a nail bed figure-of-8, described by Bristol and Verchere. Actual photograph of a nail bed figure-of-8 repair, from the article by Bristol and Verchere. No time to suture? Here’s a final trick to consider: tissue adhesive glue. A 2008 study showed that dermabond can be used not only to primarily repair the nailbed laceration (usually performed with absorbable sutures like chromic gut) but can then also be used to secure the nail in place within the eponychial fold after the repair is done. This very small study found no difference in cosmetic outcome as rated by the patients, no difference in pain experienced, and no difference in functional outcome (though it was very likely underpowered to detect these differences). However, the study did find a difference in the time it took providers to complete the repair: 9.5 minutes using dermabond and 27.8 minutes using sutures. Check out more details on the technique at Dr. Michelle Lin’s excellent blog, Academic Life in Emergency Medicine. Consider situations where a simple trepination without primary nail bed exploration may be the best management. 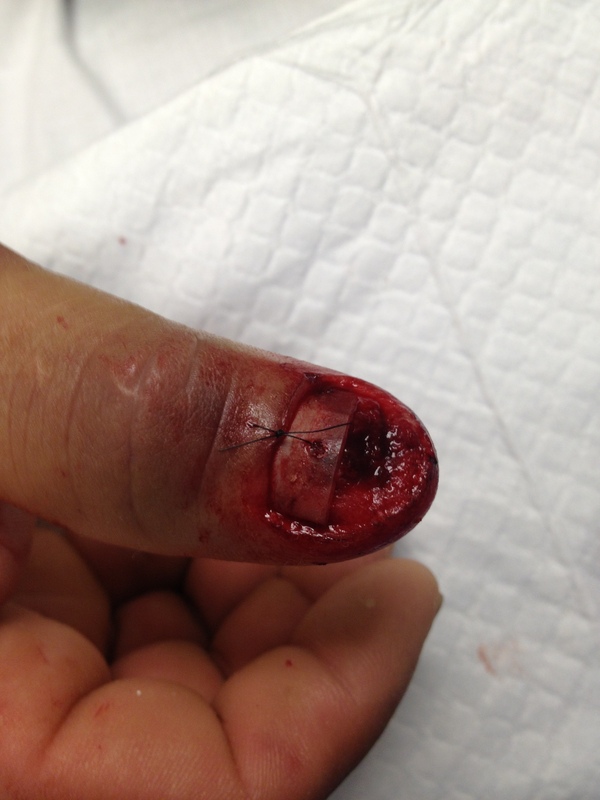 If you must get to the laceration–consider partial nail bed avulsion rather than complete when it’s possible/feasible. If you take the nail off, return the native nail (rather than a nail substitute) whenever possible. Incredible healing of the 3 year old from the first case, seen 6 at months. The nail was secured in place with sutures, but not removed. This is a testament to the healing power of children! Repair of the skill saw injury previously pictured. Though the wound at first seemed intimidating, simple interrupted sutures allowed excellent approximation of the wound margins without nail removal.